On Saturday, April 6, teams of volunteers donning gardening gloves participated in the annual Tech Beautification Day (TBD). The event has been a Greek Week tradition since 1998 and is open to Tech students, faculty, staff and alumni. TBD president Isabelle Stasenko, fourth-year BME, first participated in the event her freshman year. She appreciates how TBD allows volunteers to make meaningful improvements to campus. This year, 550 volunteers registered to participate. On Saturday morning, teams of up to 30 people convened at the Campanile in the morning for breakfast. 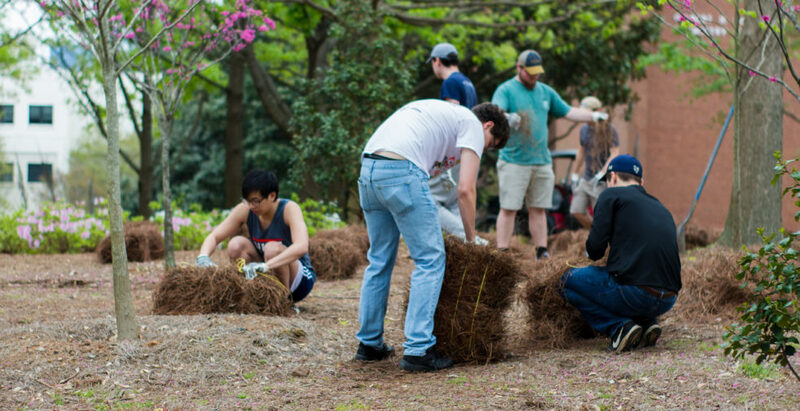 They then carried wheelbarrows, shovels and other supplies to various locations across campus for landscaping and clean-up projects. “We have people laying down sod, planting flowers, planting trees, [distributing] pine straw, cleaning up bus stations, re-stoning some of the pathways, [cleaning] up the recycling center,” Stasenko said. Because of the nature of the projects, TBD coordinates closely with Facilities. One of their advisors is Robert Paltz, a landscape services manager. The executive board has weekly meetings in the spring with Paltz and Facilities to determine which projects TBD should take on. Their communication with Facilities also ensures that their project goals remain realistic. Fourth-year IE Megan Stevens, vice president of communications for TBD, has also been part of the event since her freshman year. She first got involved through Greek Week and likes the community aspect of the event. The executive board also stressed the importance of the work that Facilities does to support TBD and the work that they do every day to maintain the appearance of campus. “It’s cool to be able to help facilities out and also, appreciate all of the work that facilities does on a regular basis, because it’s a lot of work. Campus landscaping and everything is so beautiful all the time, and it’s just cool to be able to appreciate and contribute to campus in that way,” Stevens said. Many volunteers enjoy the hands-on approach to service that TBD offers. First-time participant Vivek Rajasekar, third-year CS, predicted that the projects would have a positive impact. Sydney Tuttle, first-year IE, voiced similar sentiments. This is her first time participating in TBD as well. She heard about the opportunity through her sorority. “It sounded like something I wanted to do … It brings a lot of people together from a lot of different groups, and we’re all helping to make campus look beautiful, and when we walk by we can be like, ‘Oh, I helped make that look nice,’” she said. A lot of students at Tech spend most of their time working indoors. TBD is an opportunity for volunteers to get out of their comfort zones by asking them to try planting flowers or laying sod. In addition to Tech students, alumni, faculty, staff and their children helped volunteer at the event. Some TBD sponsors also brought volunteers. This year, sponsors included the Student Government Association, the Residence Hall Association, Facilities, Campus Services, Parking and Transportation, Capital One, Chick-fil-A, Tiff’s Treats and Papa John’s. Stevens said TBD hopes to seek out more corporate sponsors in the future to ensure that the event is as successful as possible.